This month’s newsletter is full of aromatherapy recipes for relaxation and sleep, to help support your health. I hope so! Sleep is one of the foundations of a healthy lifestyle. It’s the body’s time to restore itself, and return to balance after a long day. Sleep also gives our minds space to release tension, so we can wake up feeling mentally as well as physically refreshed. Have you ever had the experience of going to bed with a headache, and then waking up the next morning headache-free? That’s just one example of the way sleep supports us! To get sleep’s support, it’s important that we do things to support sleep—to invite it into our lives. A few examples are being sure to set aside at least eight hours for rest, taking a warm bath before bed, turning off your computer and cell phone an hour before bedtime (okay, I admit I don’t do that, but it sounds like such a good idea! )...and using relaxing essential oils (that I definitely do!)! Lavender, Patchouli, Vetiver, Sweet Orange...these are just a few essential oils that can soothe your nervous system and help you sleep. Essential oils are especially good friends for relaxation, because they work “holistically”—calming the mind, emotions, and body at once. In this newsletter, you’ll find recipes for relaxation...I just hope you don’t fall asleep while reading! Inhalers are wonderful ways to use essential oils anytime, anywhere...and no one will smell the oils but you! This recipe offers comfort and support when you’re having trouble sleeping. You can start using your inhaler about half an hour before bedtime, and then keep it by your bedside to use again if you wake up during the night. An Aromatherapy inhaler is about the size and shape of a lip balm tube. It consists of a plastic sleeve and a cotton insert, which absorbs the essential oils. To make your inhaler, just slide the cotton insert into the plastic sleeve, drop the essential oils onto the cotton, and then snap the bottom into place. You’re done! You can get Aromatherapy inhalers at Aromatics International. They have a fun variety of colorful disposable inhalers, and beautiful reusable ones. They also have organic cotton inserts for the inhalers (we’ve been waiting a long time for them to find those!). Using essential oils in baths is so popular. I think that’s because it’s simple—and so luxurious! There are a lot of ways to use essential oils in your bath, which we talk about in Aromahead’s free class, the Introduction to Essential Oils. Blending the oils into bath salt is one of my personal favorites. I’d like to share a great recipe for helping you sleep when you have a cold. I use very relaxing oils for this recipe. Cedarwood and Tangerine fit the bill! 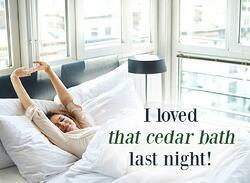 Cedarwood is very calming, perfect for bedtime, and Tangerine has a comforting, uplifting aroma. Together, they give you that “I feel so happy and sleepy” feeling. "My original motivation for enrolling at Aromahead was to gain more credibility in my business. 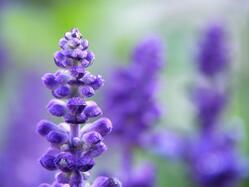 "I wanted to learn as much as I could about essential oils to teach others. I thought I had a pretty solid foundation of knowledge about essential oils and how they worked. I had taken another course in Aromatherapy from a different institution. People saw me as knowledgeable and would ask for my advice. It was an amazing feeling to be able to help them. I attended one of Andrea’s webinars and my gut told me to enroll. I signed up immediately. "In midst of Lesson 1 of my class, I realized that there was so much more to Aromatherapy than I even knew existed. I never understood the chemistry behind the oils. I never knew there were different chemotypes of the same oil. I just thought Rosemary was Rosemary. I had no clue that the constituents of the oil had such an effect on its therapeutic qualities. I had never even heard of hydrosols or Trauma Oil. 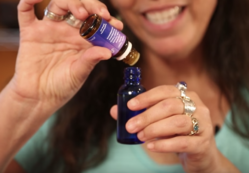 "From that point on, I made it my mission to learn as much about Aromatherapy as possible. Think of a conifer tree standing tall. It reaches up into the sky, but stays firmly grounded by also reaching deep into the earth. It’s stable and elevated at once, and the air flows easily around it. 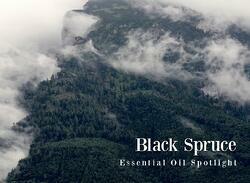 This is the way Black Spruce essential oil can support us. It opens up the breath, while helping us feel grounded in our bodies and uplifted in our minds. Black Spruce is like a friend who cheers you up after a long day—when you feel tired and all you want to do is lay down, but then you spend time with your friend and are filled with a fresh flow of relief and happy energy. Soon you can’t remember being tired at all! These recipes show you some of these soothing, restoring aspects of Black Spruce. Google Alerts sends you notifications whenever someone mentions your business on the internet. Or your name, or your hometown, or your favorite TV show…you get the idea! Knowing what people are talking about can be a great business tool! Google sends the alerts right to your email. If someone mentions you on their blog, you can go leave a comment thanking them for the mention. Or if someone mentions that they like your business, but they wish you had a certain product, you can take that feedback into account. You can set alerts to follow the news in your town while you’re away, or even to tell you when discounts or sales on certain sites happen! Then you can choose how often you’ll get notifications, what kinds of websites you want to see, your language, and even the part of the world you’re interested in. It’s a customizable system for anything you want to stay up to date on! You can read more about it and create an alert here. This essential oil linen spray makes me think of falling asleep in a field of flowers. It’s comforting, calming, and surrounds me with beautiful aroma when I tuck myself into bed. Feeling sleepy yet? I hope these recipes help you relax and get all the rest you need to feel healthy and happy!